Un excellent jeu. Manquent un mode 2 joueurs et une durée de vie plus longue. In the end, AFD is a niche title that does what it is supposed to, albeit a bit slowly in terms of speed. But when one considers the fact that this game does so closely resemble and feel like Ace Combat, one cannot help but realize that the title is sure to please many fans of that series. That in mind, AFD is an enjoyable, albeit very arcade experience, which many will find pure pleasure in playing. While it may not be the most gorgeous flight game on the system to date (those honors go to Aero Wings) it is the only combat flight simulation, and it is a damn good one to boot! As far as game replay goes, there isn't much life left in Air Force Delta once you've beaten it on all the difficulties. Sure, it may be cool to replay those canyon winding, missile dodging missions, but the lack of the ability to fully customize your craft and go head-to-head with a friend seriously reduces the replay value of the game. Once you beat the game a couple of times, you'll probably find yourself playing only one or two missions over and over again just for the pleasure to shooting off missiles at your enemies. Air Force Delta is a very impressive first generation title from Konami and deserves it's fair amount of praise, however the amount of superior flight simulators on the PC market keep this title from being a must buy game. Air Force Delta ist eine ganz klar überdurchschnittliche Action-Flug-Sim, die sich ihre Zwei durch die rasante Action und gut ausbalancierten, wenn auch zu leichten Missionen, redlich verdient hat. Allen Multi-Platform-Usern sei jedoch geraten, falls sie das noch nicht getan haben, eher auf Ace Combat 3 zurückzugreifen. Das bietet - abgesehen von der Optik - mit seinem Multiple-Story-System, massig Sprachausgabe und verschiedenen Waffensystemen noch ein Quentchen mehr Spielspaß. An Eagle One kommt Deadly Skies meiner Meinung nach zwar nicht annähernd heran (zu viel Action, zu wenig Strategie), stellt jedoch zumindest für die (noch) vernachlässigte DC-Fraktion ein absolut durchgestyltes Produkt dar. Wem Aerowings zu zivil war, und wen es nach zünftiger High-Sky-Action verlangt, wird mit Konamis Flieger zweifellos für einige Zeit glücklich werden. Inwieweit ihr euch jedoch motivieren könnt, das Game bzw. einzelne Missionen mehrmals durchzuspielen, um auch wirklich alle Maschinen in eurem Hangar stehen zu haben, sei allerdings dahingestellt. Nach einmaligem (plus einige Missionen beim zweiten Durchgang) Durchzocken hat's mich ehrlich gesagt nicht mehr sonderlich vom Hocker gerissen. Konamis erster Action-Titel kann zwar niemanden vom Hocker reißen, aber jedem Fan von Shoot 'em Ups oder Flugspielen sei geraten, einen Blick auf das überdurchschnittliche Werk zu werfen. Es kann durchaus begeistern, obwohl der Reiz nach dem ersten Durchzocken recht bald verloren ist. Auf Grund mangelnder Konkurrenz werden Fans dennoch zugreifen. En definitiva, es posible Deadly Skies no sea un simulador muy sofisticado, pero el estilo más arcade de su acción invita a disfrutar de las misiones como un... bueno, como un piloto de cazas de combate. Si te gustan los juegos de aviones de tipo arcade sin excesivas complicaciones, esta creación de Konami es una buena opción, pero no esperes ninguna floritura técnica, ni nada excesivamente innovador. Amantes de los simuladores abstenerse. Une réalisation très bonne fait de Deadly Skies un bon jeu de combat aérien. Les missions sont assez variés, il y a un minimum d’évolution au cours du jeu et la jouabilité est agréable, bien que limitée. C’est peut-être dans la durée que Deadly Skies aura du mal à s’imposer. Air Force Delta is eerily reminiscent of Ace Combat 2. So much so, in fact, that you could easily call AFD an Ace Combat clone. You'll watch briefings play out with a large arrow depicting your course, and earn money to purchase all sorts of different real-life planes, each with its own pluses and minuses. Heck, even the briefing font seems as though it were taken directly from an Ace Combat game. 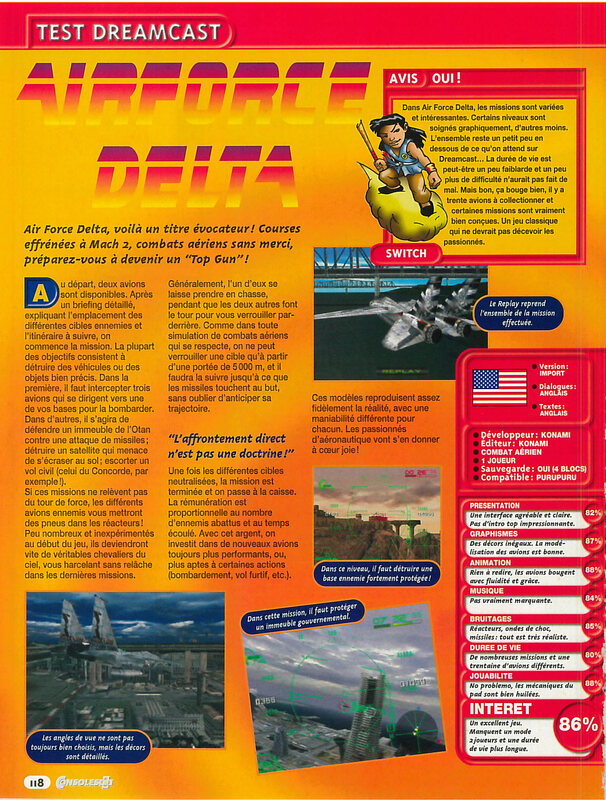 That's not to say that Air Force Delta is a bad game. I, for one, welcome the concept of an Ace Combat game on the Dreamcast, and since Namco's commitment to Sega's system seems temporary at best, AFD is the next best thing. Still, the game probably could be a bit better. W efekcie AirForce Delta przypadnie do gustu jedynie niektórym graczom. Tym, którzy są zbyt ambitni, by grać w shootery, a jednocześnie nie chcą się męczyć za sterami bardziej złożonych maszyn. Są tacy? Niewielu. Cóż, taki lajf! For a standard rental fee, Airforce Delta proves itself to be something worth playing. But it's probably not worth the full purchase price just because you'll discard it after you've beaten it. Sure, buying new planes is fun, but overall it loses its thrill after the first couple hours of play. For diehard flight-combat fanatics, this game would be a good purchase, but for anybody else, it's worth just a couple hours in front of the TV shootin' down some planes. Mer än ett snyggt arkadflygspel för hemmabruk är Deadly Skies alltså inte, och dess enkla upplägg räcker inte till för att erbjuda någon långvarig spelupplevelse. Men det är kul så länge det varar. Some people may not like the fact that the gameplay mostly involves locking on targets (some very far away) and shooting them down with guided missiles. There aren't many occasions to use the machine guns, which only work at very close range. Shooting down planes is fun, but the enemy explosions are rather unspectacular. After each mission, you can watch a cool instant replay. It's not bad, but Airforce Delta is less than thrilling. AirForce Delta is difficult to recommend. A patient person could probably wade through the abundant problems and issues that the game suffers from and actually get some enjoyment out of the game. But with so many better alternatives available, it is hardly worth the effort.